It turns out there are a cornucopia of reasons to stop in Yuma beyond refueling your rig and taking a potty pit stop on the way to San Diego. Yuma County, the nation's supplier of winter lettuce, greens and vegetables is promoting agritourism to give visitors a fresh taste of its bounty. Foodies can take farm tours, pick vegetables and then enjoy a farm-to-table lunch prepared with the vegetables they picked by culinary students at Arizona Western College. There's also "date night in a date grove" and tours of area date farms. Yuma boasts that its the sunniest place on the planet, which is a good reason to visit in the winter, spring or fall when the rays feel warm but aren't scorching your skin. Other area attractions include the Castle Dome City Mining Museum and ghost town, Yuma Territorial Prison and the Colorado River State Historic Park. There's an exhibit at the state park about the Plank Road -- a boardwalk for cars across the sand dunes west of Yuma that was used from 1915 to 1926. A preserved section of the Plank Road is about 12 miles west of Yuma at the Bureau of Land Management’s Imperial Sand Dunes Recreation Area, south of Interstate 8 on the Gray’s Well Road. 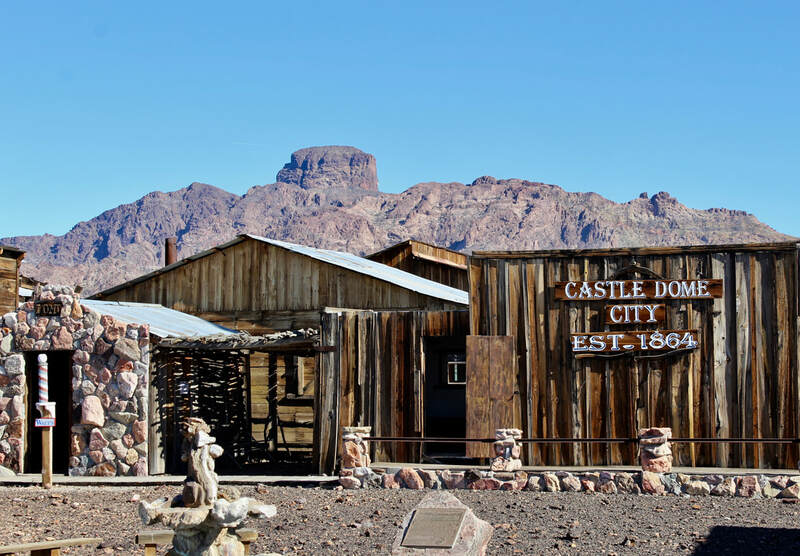 The Castle Dome City Mining Museum is about an hour northeast of Yuma and 10 miles off of US 95 at Milepost 55. It's a collection of dozens of buildings and hundreds of relics from mines in what is now the Kofa Wildlife Refuge. The exhibits are well staged and it's well worth the trek out to this remote desert site where silver and lead were mined starting in the 1860s. Another area attraction is the Yuma Proving Ground where visitors can take a tour to witness the firing of some of the military's big guns. And for a quieter exprience, Yuma has restored its riverfront along the Colorado with bike and walking trails, and a revived wetlands area that attracts hundreds of bird species. The river crossing is the historic reason for the town's existence. 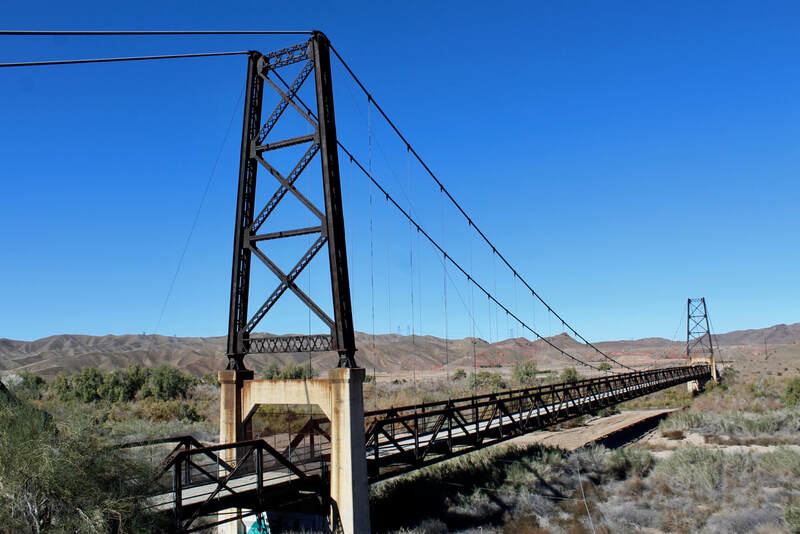 The landmark Ocean-to-Ocean Highway Bridge, completed in 1915, was a vital crossing of the Colorado River. Visit the city's Gateway Park at the foot of the bridge to see the river and the wildlife it attracts. 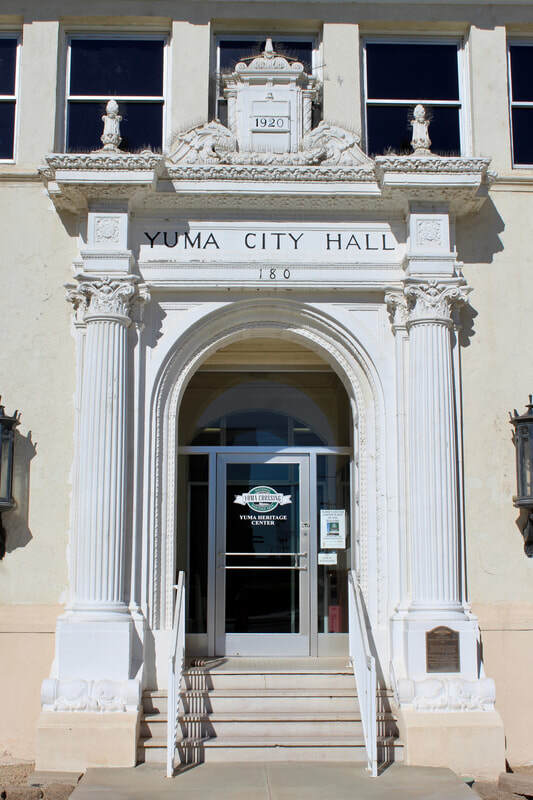 Yuma chose Spanish Colonial Revival architecture for its 1920 City Hall. suspension bridge built over the Gila River in 1929 and used for nearly 40 years before it was replaced. The bridge is within walking distance of From the Farm, a market with fresh produce, tacos and vintage collectibles. Travelers can rent a bicycle at the state historic park to ride bike paths along the river and explore downtown Yuma. ​There are a number of bars and restaurants in early 20th century buildings in downtown Yuma. Grab a burger and play pool at Lute's Casino. Try the beers at the Prison Hill Brewing Co. or drink with the locals at Red's Bird Cage Saloon. And it goes without saying that you have to pack your sense of Yuma when you visit. 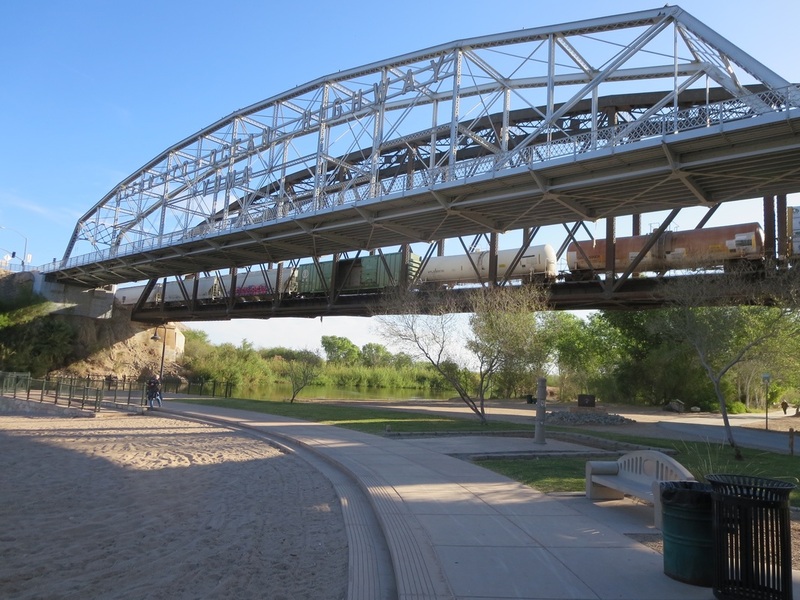 Visitors can dip their toes in the Colorado River at Gateway Park, which has views of two historic bridges and the arching Interstate 8 bridge from the 1970s. 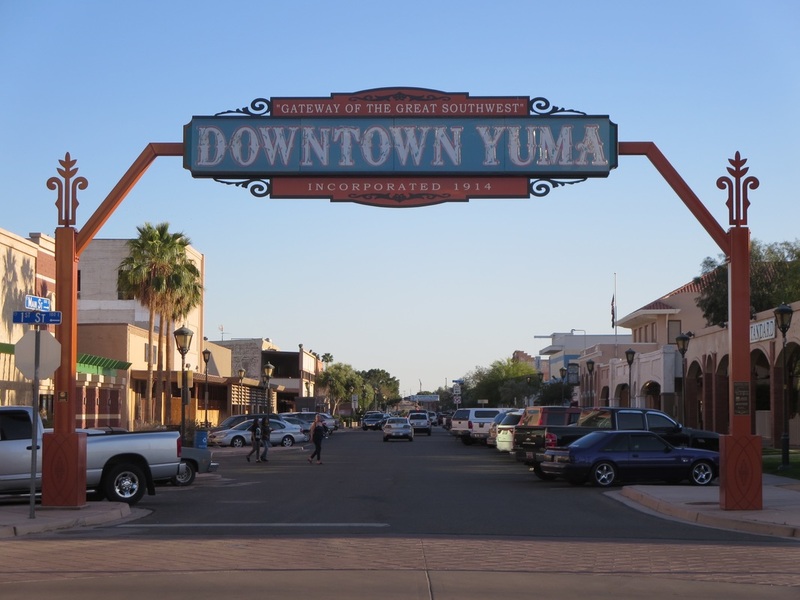 Yuma's Main Street is pedestrian friendly and has available free parking. 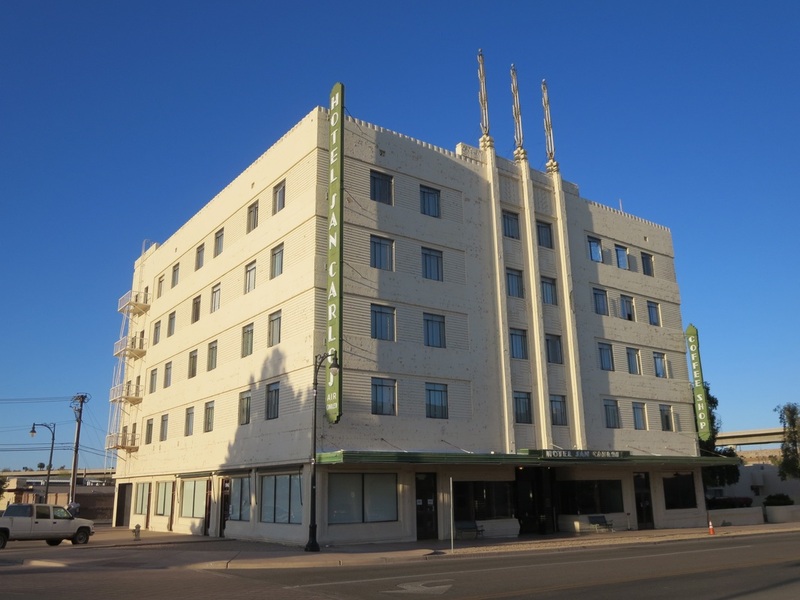 The art-deco San Carlos Hotel, built in 1930, provides elderly housing. Melody Cleaners and its sweet sign have been around since the 1950s. This sun-blasted sign marks a dive bar on Yuma's Fourth Avenue. Castle Dome City Mine Museum, an hour northeast of Yuma, is a collection of buildings and artifacts from the area's silver and lead mines. The 1929 McPhaul Bridge spanned the Gila River northeast of Yuma. 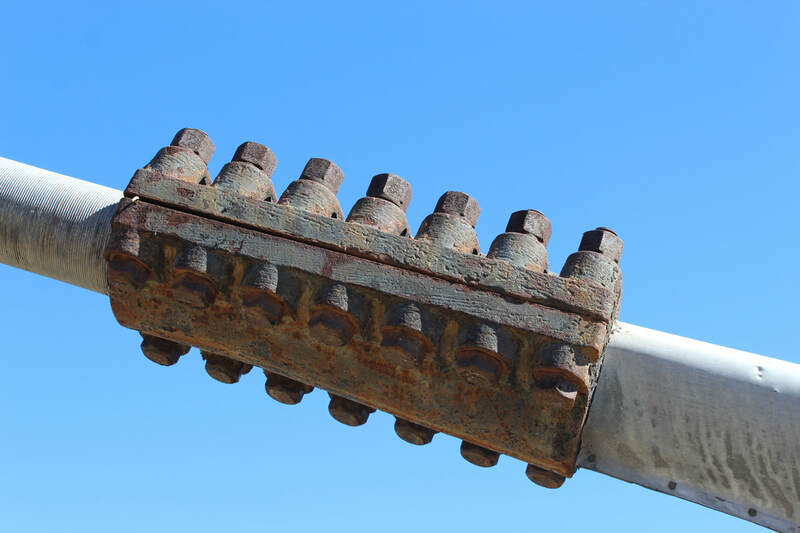 Replaced in 1968, it's now a "Bridge to Nowhere" over a dry wash.
Yuma's Ocean-to-Ocean Bridge was the first highway crossing of the lower Colorado River in 1915. It's now serves the Quechan Indian community.